05 Apr Which restockers are behind young cattle price lift? 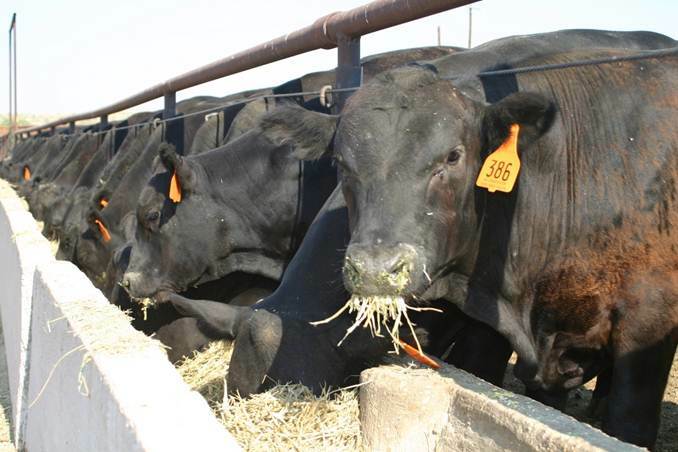 The percentage of purchases of young cattle being bought by restockers is outstripping both feed lots and processors. Nominal volumes of young cattle being sold to restockers in Northern and Southern saleyards are also above longer term averages this season. Price spread patterns show that Southern restockers are more optimistic than their Northern counterparts. Anecdotal reports of revived restocker activity within the young cattle market suggest that recent rainfall may have given a boost to prices along the Eastern seaboard. But does the underlying data for the Eastern Young Cattle Indicator (EYCI) show this to be the case and if so, is it evenly spread across the Eastern states? Is just a simple glance at the broad restocker activity all that is needed to give a robust picture of the market or is it central to beef analysis to delve a bit deeper into the figures? Certainly recent discussions with livestock agents reveal that restocker activity in their area is on the rise and a Meat and Livestock Australia news report from last week somewhat confirmed the trend. 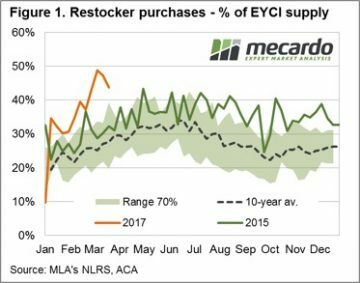 Indeed, as figure 1 highlights, the percentage of EYCI stock sold to restockers as a proportion of total EYCI sales for the 2017 season has been on a fairly clear upward trajectory. Although looking at restocker purchases in terms of percent of supply doesn’t necessarily indicate increased nominal volumes are being purchased by restockers, but that the proportion of restocker purchases is higher when compared to cattle purchased by feed lots and processors. 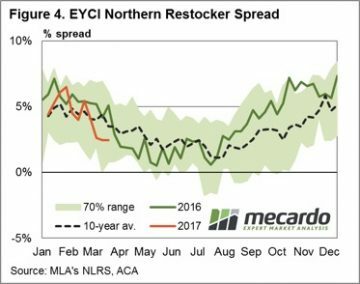 Using the underlying EYCI data we are also able to filter and analyse specific components of the broader EYCI market to determine if the robust restocker demand this season is stemming from a particular region. 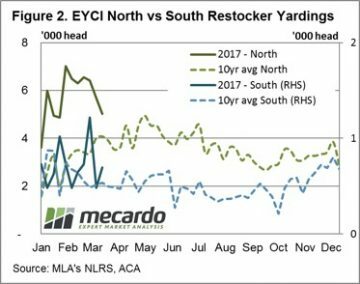 Separating EYCI restocker purchases into northern and southern saleyard groups, with Dubbo saleyard marking the mid-way point between North and South, we can assess how evenly distributed the restocker activity is along the East coast. During February the volume of cattle purchased by restockers at Northern sale yards on a weekly basis peaked near 7,000 head (double the volumes of the ten-year average during this time frame, but similar to levels seen during last season). Restockers in Southern sale yards have seen weekly volumes peaking at around 1,200 head during March, which is nearly 2.5 times the volumes normally seen at this time of year – according to the pattern set by the ten-year average (Figure 2). Taking a look at the price spread patterns for Southern and Northern sale yards we can see that there are some stark differences between restocker activity in each region. 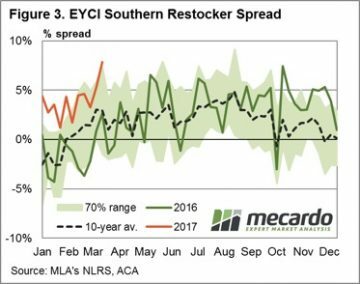 Figure 3 shows that Southern restockers have been happy to pay a premium spread above the EYCI trending along the top of the normal seasonal range and peaking last week at 8%, equivalent to 687¢/kg cwt. In contrast, Northern restockers are paying a premium spread in the lower end of the normal range and below the seasonal average level for this time of year at 2%, equivalent to 649¢/kg cwt – figure 4. The above average volumes of cattle being purchased by restockers in both the North and South certainly shows the intention to rebuild the herd is evident across the Eastern seaboard. Although, considering the magnitude of destocking experienced in the North during the large turnoff during the 2013-2014 seasons the current volume of cattle going to restockers in Northern saleyards isn’t much dissimilar to levels seen last season. In addition, the spread pattern of the North and South indicate that Southern restockers are more optimistic of the current season or are experiencing somewhat better seasonal conditions than their Northern counterparts, as signalled by intentions to pay much more above the EYCI than normal for this time of year.